Sometimes it really helps to see rings on hands, so you can really get an idea of what your ring will look like, ahead of time. 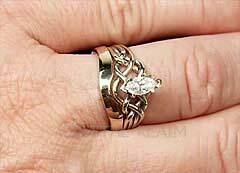 This page is dedicated to images of our beautiful Celtic engagement puzzle rings on hands. This blog post is by Mandira for Crystal Realm, so if you need help, please call her at 1-866-573-7381. Thanks for reading on! We will create a stunningly unique bridal set with a diamond puzzle ring and a custom fit shadow band. Each bridal set is completely unique. Your puzzle ring will be hand-woven to bear the very stone you select (marquise, round, princess-cut, or antique square). This means that each loop and twist of the puzzler ring is created by hand. Then the shadow band is made from an original, hand-carved wax; a mold is made, and then the ring is cast and polished to fit perfectly with the puzzle ring. Marquise diamond puzzle ring in palladium and 14K rose gold with palladium, 2mm, custom shadow band. This puzzle ring is shown with an open weave – the better for fitting a shadow band. This puzzle ring has three bands, so we call it a trinity puzzle ring. 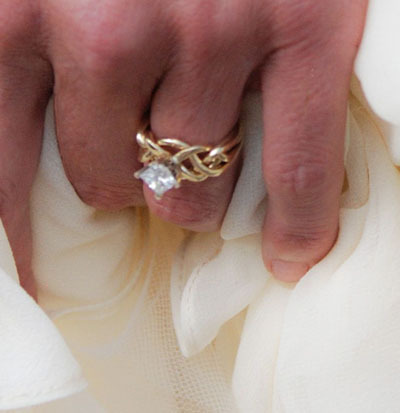 The ring below is shown with a 0.71CT diamond, the heaviest diamond we can place on the medium weight ring. You may order this puzzle ring with a diamond starting at 1/3CT. Marquise diamond trinity puzzle ring – this puzzle ring has three bands, for the Father, Son, and Holy Ghost, or for the couple and the Creator who brought them together. This lovely 14k white gold, four band puzzle ring is shown with a 1/3CT diamond. Like the ring above, this can hold a diamond up to 0.72CT weight. 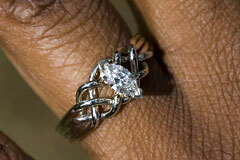 We can make this ring with a tight, standard, or open weave. This puzzle ring is made with a standard weave. 1/3CT marquise diamond puzzle ring in 14K white gold. Start by ordering the puzzle ring, then contact us for the shadow band. Your puzzle ring will be hand-woven to your order, and your shadow band will also be custom made to fit with your puzzle ring. You may order by calling Crystal Realm at 1-866-573-7381. Marquise diamond puzzle ring with custom, contoured, shadow band, all in 14K yellow gold. For more information about this bridal set, please contact Mandira from Crystal Realm at 1-866-573-7381. Guinevere Royale puzzle ring with 4mm princess-cut sapphire and side emeralds with custom, contoured, Celtic knotwork shadow band, all in palladium. 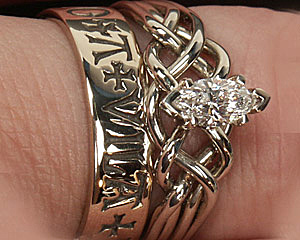 Four Band Marquise Diamond Puzzle Ring with “a vila mon coeur, gardi li mo” posy ring, meaning, “Here is my heart, guard it well.” This set is made in 14K white, yellow, or rose gold. You may start by ordering the puzzle ring and add the wedding band when you are ready. Or you may order each piece separately at the same time. Order the marquise diamond puzzle ring with a standard weave. You may order it in any color of gold on this page. Order the French posy ring in 14K white gold. Order the French posy ring in 14K yellow gold. Order the French posy ring in 14K rose gold. This set is available in three colors of 14K gold and platinum (not palladium). 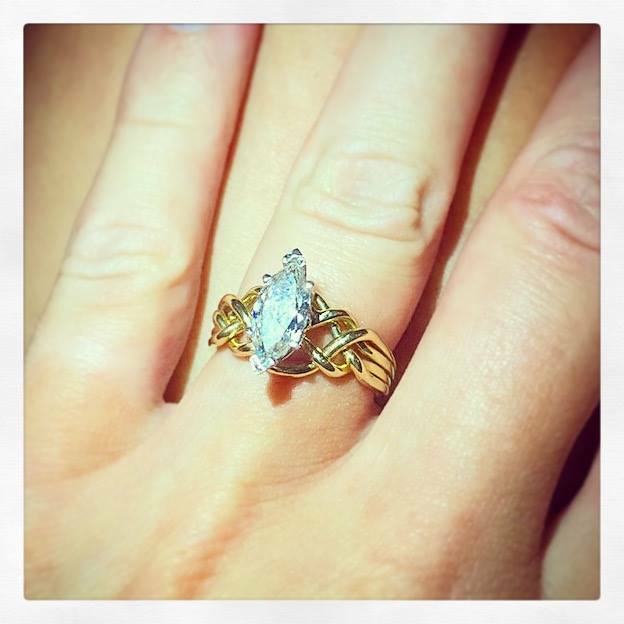 Marquise diamond puzzle ring with French poesy ring. Poesy ring is inscribed with ‘a vila mon coeur gardi li mo,’ meaning ‘here is my heart guard it well.’ Shown in 14K white gold. Please call for the wedding bands in palladium. This beautiful set is available in 14K yellow gold, 14K rose gold, palladium, and platinum. It is not available in 14K white gold, as the bands won’t quite match the 14K white gold of the puzzle ring. Why is that? 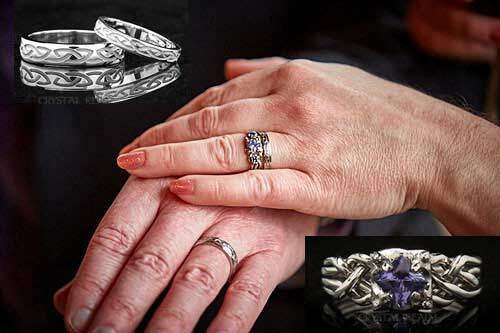 Most 14K white gold rings available today are rhodium plated. It’s a naturally white metal used to make the off-white of 14K white gold appear bright white. Our puzzle rings are not plated, so we make the white version in palladium or platinum, so colors will match. Guinevere puzzle engagement ring with princess-cut tanzanite. Bride and groom are wearing Celtic recessed eternal knot bands. All in palladium. We quote diamond rings in the one carat range individually, as the price you will pay can vary so widely depending upon what diamond qualities are important to you. Our bias is that the diamond must look gorgeous and sparkly on the hand, so we won’t set it in the ring. We can often save you money by going down the scale a tad on diamond characteristics that don’t show on the hand in favor of beauty and sparkle – oddly enough, they are the only two qualities that diamonds are not grade on that actually make the most difference to how the final ring will look on your hand. For a quote, please call Mandira at Crystal Realm at 1-866-573-7381. 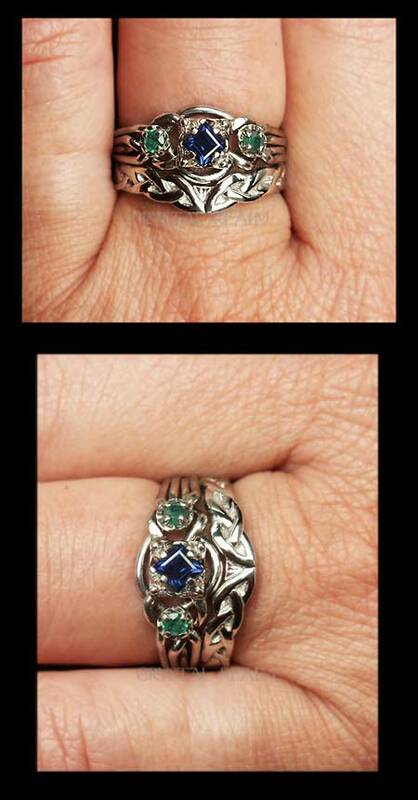 We made this ring for a customer in Australia. It is made from 14K rose gold and platinum, with a 0.72CT marquise diamond. The puzzle ring is a four piece, and it’s easy to put together using Crystal Realm’s simple instructions. The weave of this puzzle ring is open, and we made a shadow band to go with it. 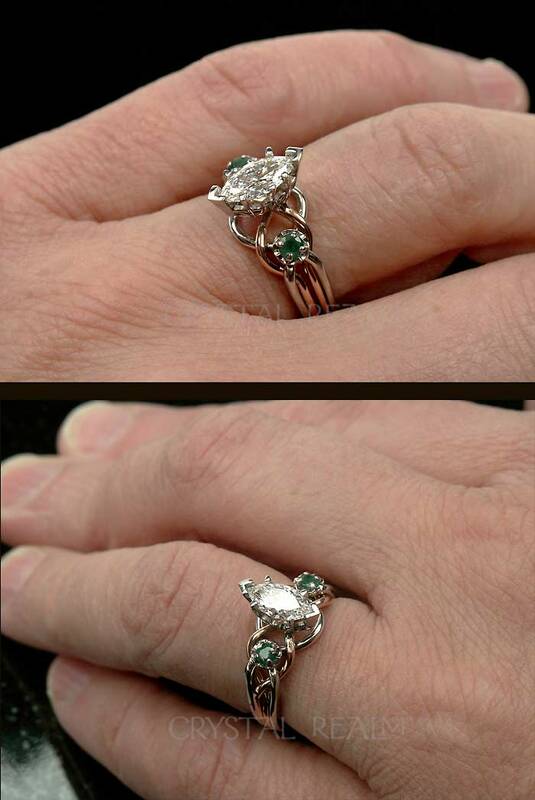 Marquise diamond puzzle ring with emerald accents. The diamond shown is 0.72CT, but this ring can be made with any size diamond starting at one-third carat. The metals are platinum and 14K rose gold. We can make this engagment puzzle ring with any stone you want and in any stone size. Shown is a rhodolite garnet, which is a purple-red. We think it is striking with 14K yellow gold, but like all of our sets, it’s available in the precious metal or metals you want. This uniquely beautiful bridal set consists of a Guinevere diamond puzzle ring with a custom-fit shadow band, all in 14K gold. 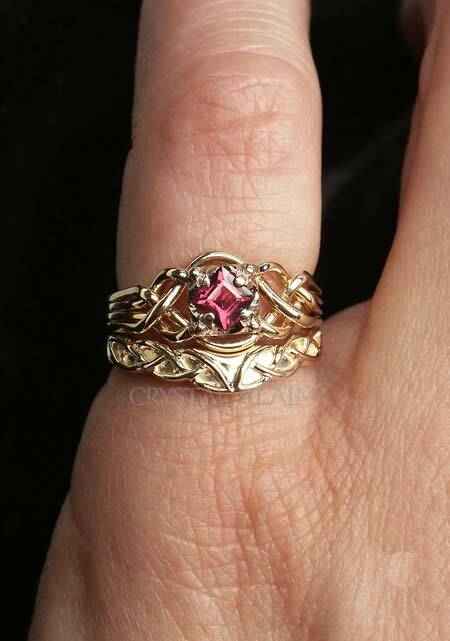 At present, we don’t have this exact set on our site, but we have it with the puzzle ring made of four colors of 14K gold: rose, yellow, white, and green. The shadow band is 14K yellow gold. 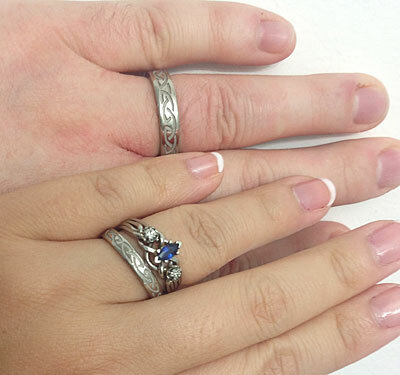 As with all of our sets, you may have it in whichever precious metal or metals you want. Princess cut diamond puzzle ring with custom shadow wedding ring. 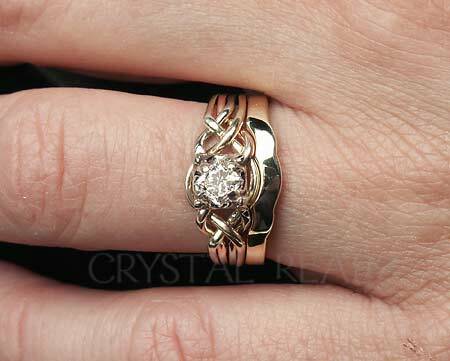 Completely hand-made, your bridal set will be a one-off original. Our customer Laura wearing her ring at her wedding in Italy. 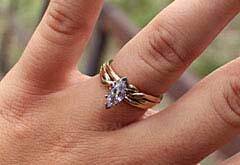 Her ring size was about 4.5, so you can see how great even a heavy weight puzzle ring with a large stone looks on a small hand/small finger.